CD – Introduced commercially in 1982, digital optical disc data storage or CDs are now inexpensive storage options capable of holding about 700 MB at data. Handling, manufacturing defects and environmental exposure can effect the integrity of CDs. Storage life can be from 5 to 50 years depending on conditions. DVD – Since 1995 digital video discs have capacity of 4.7, 9.4, 8.5 and 17 GB depending on the number of layers and sides of the disc. DVD can contain 6 to over 20 times the amount of a CD. Disc composition, media quality, humidity and light storage conditions effect storage integrity. 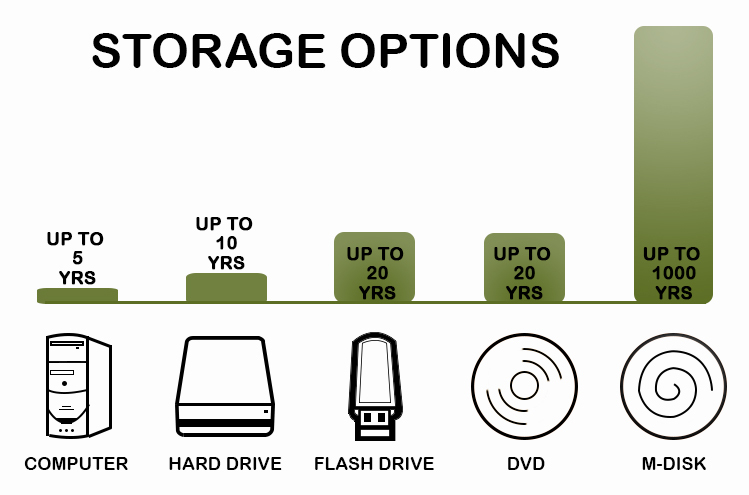 Storage life can be from 5 to 20 years depending on conditions. USB Flash Drive – Available since 2000 these data storage devices increase capacity each year. An 8 MB USB flash drive has the storage capacity of 5 CDs. Storage life can be from 5 to 20 years depending on conditions. External Hard Drive – Introduced in 1956 these data storage devices have evolved to become the leader in low-cost capacity and performance storage. Due to the close proximity between heads and disk surface, these units are susceptible to head scrapes caused by electronic failure, sudden power failure, physical shock, contamination of the drive’s internal enclosure, usage, corrosion or manufacturing defects. These devices last from 2-10 years depending on conditions. Cloud Storage – Popularization of cloud storage began around 2006. Capacity is almost limitless and performance is superior. Due to cloud redundancy measures the reliably of this type of data storage is superior. M-Disk – Commercially available since 2010 these devices provide greater archival media longevity. This relativity new solution claims to store data that will last 1000 years. Call My Family Online (800) 285-1888 to formulate your storage plan today.